When you are using internet broadband or wireless, sometime you want to ensure that the computer automatically downloads updates by using windows update only while connected to wired connection. 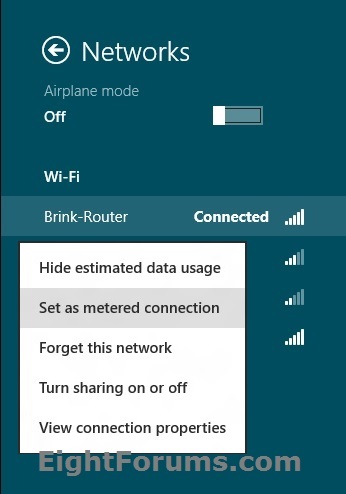 This tutorial will show you how to mark (set) any wireless network (ex: Wi-Fi and mobile broadband) as a metered or non-metered connection to help reduce data usage for that network connection for all users in Windows 8. A metered Internet connection is when a service provider charges by the amount of data sent and received by your PC. Windows Update will defer the background download of all updates, unless it's a critical security update, until you connect to a non-metered network, such as your home broadband connection or another wireless network not set as metered. You can always override the deferred download by launching Windows Update and manually checking to initiating the download of updates when you like. Some Metro apps may behave differently on a metered connection to reduce data usage, such as allowing a low-definition vs. high-definition video stream, or a header-only vs. full-sync of email. If metered internet connections is turned off, then device software will not be downloaded when connected to a metered connection.